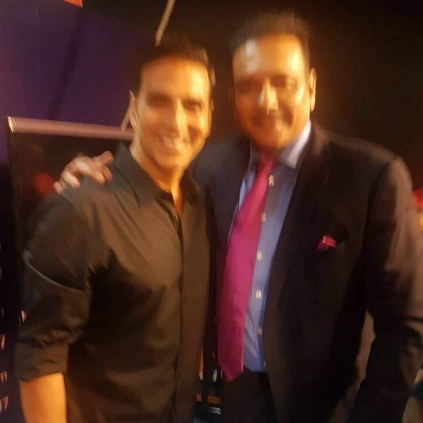 Ravi Shastri, former Indian cricketer turned commentator recently uploaded a photo with Akshay Kumar on his Twitter account. He tweeted. 'Great to catch up with a fellow Don Boscoite who has done wonderfully well in career as an actor @akshaykumar'. The image that Ravi Shastri uploaded was completely blurred and seemed he uploaded without giving much attention to it. Soon, Twitterati took complete charge of the situation and brutally trolled Ravi Shastri who later started trending. Some of the trolls even included his commentary terms which were extremely funny and filled with sarcasm. ‘Ravi Shastri’s tweet not spell-checked’. Looks who has dubbed for director Anurag Kashyap in Imaikkaa Nodigal! Who is Shruthi Haasan's replacement in Sangamithra? Kamal here, who is it going to be there? People looking for online information on Akshay Kumar, Ravi Shastri will find this news story useful.